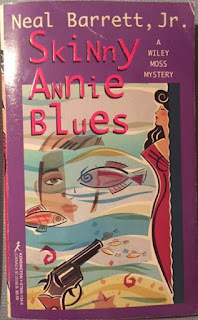 Some perhaps forgotten mysteries by Neal Barrett, Jr.
Not That Old, Not a Bestseller: Pink Vodka Blues, and Skinny Annie Blues, by Neal Barrett, Jr. Here's a couple of books from the '90s, so not that old. And I doubt they sold all that well. But they are somewhat fun books by a writer who did some very fine work in the SF field. These are mysteries, however, and it's my sense that they have drifted quite quickly into Forgotten status. Neal Barrett, Jr. (1929-2014) began publishing SF with stories published more or less simultaneously in the August 1960 issues of Galaxy and Amazing, so he was either (or both) a Gold (and Pohl?) discovery or a Goldsmith discovery. 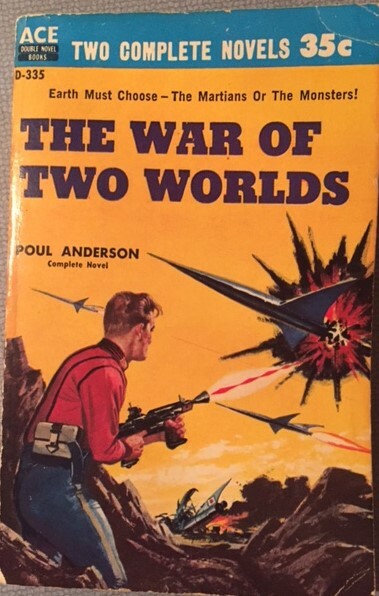 That said, he also worked for the Stratemeyer Syndicate, publishing as by Victor Appleton and Franklin W. Dixon, so presumably he wrote both Tom Swift stories and Hardy Boys stories, though I don't know when. His early work was decent but not particularly special, but in the 80s and through the 90s he published some excellent novels (most notably Through Darkest America) and stories (my favorite being "Stairs"). Later he turned to mysteries of a somewhat gonzo tone, as with these books. He was SFWA Author Emeritus in 2010. In the '90s he published a number of mysteries. Most of them have titles ending in "Blues". Some of are part of a series about a guy named Wiley Moss. I saw a number of these titles for sale at a remainder shop in Branson, when on vacation. (Which raises the question -- why are mass market paperbacks being remaindered? And are authors getting screwed in the process?) 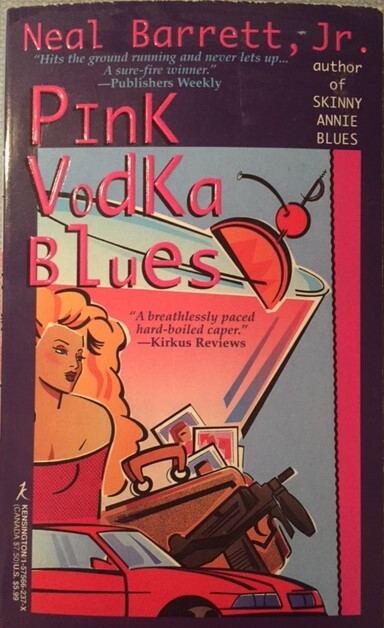 I looked for the earliest one in the pile, which turned out to be Pink Vodka Blues, from 1992. 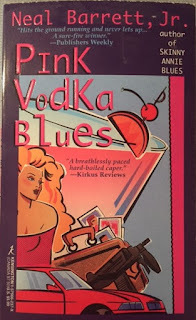 Pink Vodka Blues is not a Wiley Moss mystery, nor indeed, it would seem from internal evidence, part of any ongoing series at all. The lead character is Russell Murray, a seriously alcoholic writer for a literary magazine in Chicago. He returns from a trip to Dallas for his editor with absolute no memory of where he's been or what he's done. Worse, he wakes up in a hotel room with a naked woman he doesn't recognize -- and minutes later a couple of hitmen smash their way into the room and kill the woman -- the terrified Russell escapes by sheer luck. Naturally enough, he is soon the prime suspect in the murder of the woman, and he is quickly on the run. He still has no idea what happened in Dallas -- he was supposedly delivering a manuscript to a reclusive author while his editor, who was supposed to do the job, spent the weekend with his mistress. Soon Russell learns that his editor is the nephew of a local mob boss, and that two factions in the mob want whatever Russell was supposed to deliver, which delivery apparently never happened. Russell can't help, because his memory is shot. He ends up in a rehab facility after passing out in his car -- and there he meets a beautiful and rich alcoholic woman. When the mob track him down, he and the woman escape, and rather clumsily and drunkenly wind their way across the US, to Dallas, Florida, and back to Chicago, chased by two strange sets of hit people, trying to figure out what Russell has forgotten. The book is quite funny at times, though it's also a scary (and accurate-seeming) portrayal of alcoholism. The main characters are nice enough that we root for them, but they are by no means hero and heroine -- they are losers, and if they end up halfway solving their problem, only some of the bad guys get their due, and the good guys only partly get a happy ending also. Which qualifies as fairly realistic, I guess. This fits more or less into the Elmore Leonard end of the crime fiction genre, though I'd call it not as good as Leonard, but worth reading. I also found the first of his Wiley Moss mysteries, Skinny Annie Blues, from 1996. Wiley Moss is an artist (he draws bugs) in Washington, D. C., living with a beautiful but dotty woman named Giselle. He gets a phone call telling him that his Dad, who left his mother when he was a child, has died down in Galveston, and that he better not come down there. Naturally, he figures something nasty is up, and heads to Texas. Once there, he gets in all kinds of strange trouble, involving at least three more beautiful women: his Dad's new wife, a blind black woman named Grace; a restaurant owner named Annie (not Skinny Annie, though! ); and a redhaired woman who takes immediate dislike to him on the plane. Wiley blunders around Galveston, running afoul of the corrupt sheriff R. J., the mobster Pound, the various women, and low rent criminal Harry Sykes. Everybody seems to assume he knows something about the deal his Dad had going before he died. It's all a bit chaotic, and it depends on people acting fairly stupidly. There's a lot of funny stuff, and some wild stuff, but it doesn't really cohere. Minor. As I said in my Hugo nomination suggestion post, I haven't read enough novels to speak with great authority. I did recommend All the Birds in the Sky, so I'm very happy with that nomination. Ninefox Gambit and Everfair are on my list of novels I mean to read soon and am excited about. I will confess abashedly that I have not even heard of Borderline (though I do recall enjoying a short story by Baker a couple of years ago). And of course I should also read The Obelisk Gate. Further comment will have to await a lot more reading. Again, some guilty not-yet reads in this list -- I've got a copy of A Taste of Honey, I think; and I certainly mean to get to it and to Every Heart a Doorway soon. I'll add Runtime, which had somehow escaped my notice, to the list. "The Liar" is a good story and I recommended it in my column. The Dream-Quest of Vellitt Boe is great, and I will be surprised (and pleased, mind you) if any of the stories I haven't yet read surpass it. I confess disappointment that Lavie Tidhar's "The Vanishing Kind", which I thought head and shoulders better than any novella I read last year save The Dream-Quest of Vellitt Boe didn't make the shortlist. The Ballad of Black Tom is strong work, and it would go second (as of now) on my (non-existent) ballot. All that said, I think this is a pretty strong shortlist. And what a year for Tor.com, eh? Three stories that showed up on my list of potential Hugo nominees. ("Red in Tooth and Cog" was on my Short Story list (my word count for it is 7000, making it technically a Short Story but eligible for nomination as a Novelette).) The other two are "Blood Grains Speak Through Memories" and The Jewel and Her Lapidary. (Curious that in length those three stories are at the very bottom end of novelette, right in the middle, and at the very top end.) The remaining three stories are decent work that I didn't have listed among my favorites of the year, but none of them strike me as poor stories. So, again, a pretty strong shortlist, with my personal inclinations favoring either Cat Rambo's story or Jason Sanford's story; with Fran Wilde's a close third -- a win for any of those would make me happy. UPDATE: Apparently there is no deadband for Nebula nominations, and "Red in Tooth and Cog" has been declared too short for novelette. It would have been nominated as a Short Story, but Cat Rambo graciously declined the nomination. The only story here that was on my personal Best of the Year list (and which is in my book) is Sam J. Miller's "Things With Beards", which thus is my choice to win from this list. I read all the rest, and, as with the novelettes, i think they are all fine work. Caroline Yoachim's story was one of those I considered for my book but which didn't make the cut -- and it's pretty funny too, which is nice to see. So I'd rank it second, with Brooke Bolander's intriguing story third. 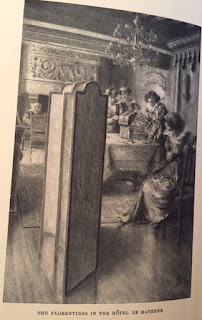 Oh, and I confess I haven't yet seen A. Merc Rustad's "This is Not a Wardrobe Door", so perhaps it will push its way onto my top list when I read it. Presented for information and congratulations. I haven't read any of these. I do have a copy of Arabella of Mars, and I do want to read it; likewise, I plan to get to Delia Sherman's novel sometime, and, I really should start to catch up on Frances Hardinge: I've loved what I've read by her, but I haven't read anything lately. Back this week to a true Old Bestseller. 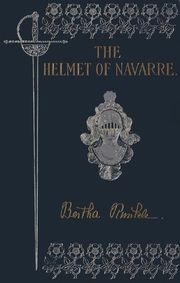 The Helmet of Navarre was the third bestselling novel of 1901 according to Publishers' Weekly. It was first serialized in the Century magazine in 1900, and The Century Company published the book the following year. 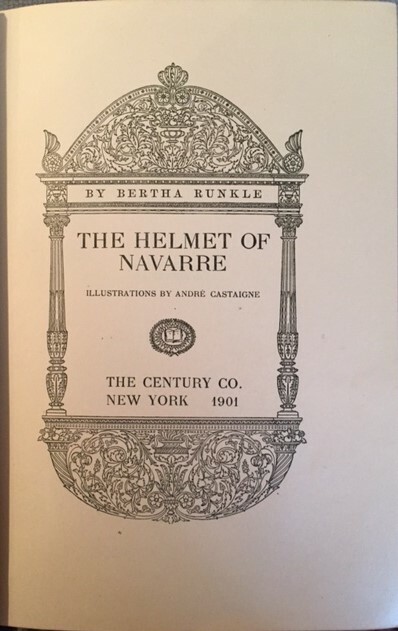 Bertha Runkle was not yet 21 when the Century accepted her novel, and indeed much was made of her youth when the book became a success. She was born in 1879 to Lucia Runkle, an editorial writer for the New York Tribune (and said to be the first woman on the editorial staff of a major metropolitan newspaper). Her father was a lawyer (he represented the Tribune). Her father died when Bertha was only 9. Lucia Runkle, besides her success as a journalist, was well connected in the literary world, serving as an advisor for Harper and Brothers, and collaborating with Charles Dudley Warner (hinself also a collaborator with Mark Twain, co-coiner of the term "The Gilded Age" (with Twain), and originator of the phrase "Everybody talks about the weather but nobody does anything about it" (inevitably often misattributed to Twain)) on the 30 volume Library of the World's Best Literature. 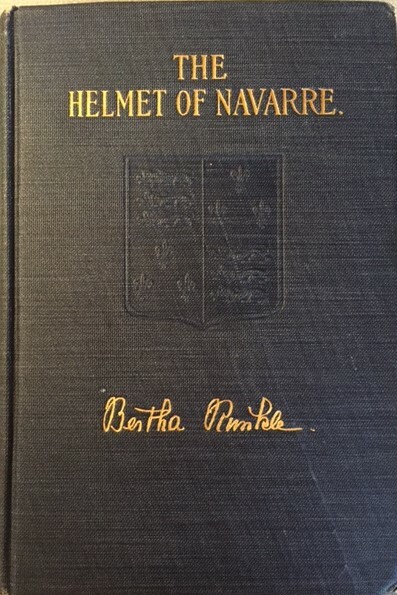 Bertha Runkle eventually wrote 6 novels, though none of the others had quite the success of The Helmet of Navarre. She married Captain Louis Bash in 1904, and lived with him in the Philippines (where he was stationed), San Antonio, and Washington, D.C. She died in 1958. My copy appears possibly to be a first, though the cover isn't as nice as the image shown above. It does still have the script version of Runkle's name. It is illustrated, nicely enough, by Andre Castaigne, although the reproductions (in black and white) of the illustrations are a bit muddy. 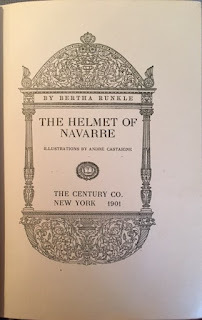 The Helmet of Navarre is an historical novel, set in 1593, in Paris. The Catholic League is in control of Paris, but the rest of France is controlled by the King, Henry IV. Henry was born Catholic but raised as a Protestant by his mother, the Queen of Navarre (it's not clear to me if this Navarre was the French region near Navarre in Spain, or the Spanish Kingdom of Navarre, or if at that time the two Navarres were one). Henry has decided to convert permanently to Catholicism in order to remove that objection to his taking the crown. The Catholic League is not entirely happy about this -- they don't believe Henry is a true Catholic, and anyway they will lose power. All this is historical background I gleaned from Wikipedia -- the book doesn't go into nearly that much detail (though one gathers a lot of the basics from it). The novel is told, very engagingly, in the voice of Félix Broux, a very young man (16 or 17?) who has come to Paris from provincial St. Quentin to serve his beloved master, the Duc de Saint Quentin. (His father is Master of the Forest for the Duc, and has only now reluctantly allowed Félix to leave the estate.) The Duc is in Paris, supporting the King, which puts his life in danger, because Paris is a Catholic League city. However, when Félix tries to gain the Duc's attention, he is rebuffed, especially by the young man who accompanies him, whom Félix assumes is his once estranged son, the Comte de Mar. Félix finds lodgings, across from a house rumored to be haunted by Huegeonots murdered in the St. Bartholomew's Day Massacre, and indeed in the night he sees three people across the way, who appear to be ghosts. One thing leads to another, and Félix ends up in the haunted house, where he meets three young men, who turn out to be alive enough. He is almost killed for his pains, but one noble young man spares his life. Félix has learned that this trio has plans to lure the Duc's assistant, Lucas, into the open to fight a duel, over a woman. Lucas seems a coward. Félix agrees to help them, but then he learns from another plotter that in fact the plan is to entice the Duc out to be murdered. Although Félix swore to keep the plotters' plans secret, he cannot allow this to go on, so he forces his way into the Duc's presence and reveals the plan -- which is all the more wrenching because it turns out that the nobleman who had saved Félix' life is in fact the Duc's son, while the rude young man Félix had met in the Duc's company is Lucas. The upshot is, of course, that the Comte de Mar was innocent of the plot to kill the Duc -- this was hatched by Lucas and by one of the Comte's supposed friends. Félix manages to reconcile the Duc and the Comte, and there is an encounter with Lucas and the other plotter -- one man is killed, but Lucas escapes. We learn the real reason for the estrangement between the Comte and his father is that the son is in love with Lorance de Montluc, the beautiful niece of the Duc de Mayenne, leader of the Catholic League. The rest of the novel, then, involves Mar's desperate attempts to rendezvous with Lorance, and her concern that she will be married off -- perhaps even to Lucas, who is secretly working for Mayenne. Meanwhile the Duc dodges assassination attempts while maneuvering to strengthen King Henry's position. 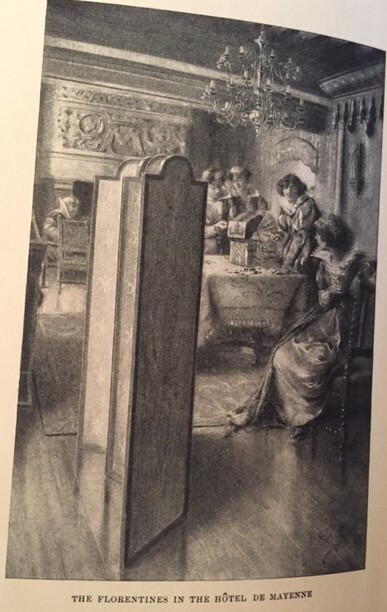 Félix is involved in much of this -- dressing up as a woman (as shown in the illustration here), lurking in secret passages, swordfighting, spying on the slimy Lucas; while Mar vows to be a better man, loyal to the King, but also to marry Mlle. de Montluc despite her family loyalty to the King's enemies. Of course all works out nicely, over a very brief period of time (the action takes place over just a few days). The Comte gets his lady, Félix is established as a highly trusted retainer, the Duc gains back a son he can be proud of, and of course his efforts for his King bear fruit. The general historical outline is pretty accurate, and indeed Henry did convert (or reconvert) to Catholicism (famously saying "The Crown is worth a Mass"); and he turned out to be a very good King, among other things promulgating the Edict of Nantes, which guaranteed more rights to Protestants (which ended up getting him assassinated by a Catholic fanatic). This is a very fun historical romp/romance. Of course it is cliché ridden, the action is often implausible, etc. etc. -- all part of the standard expectations for the genre. But it's nicely told, Félix' voice is witty and engaging, the love affair is typical enough but still sweet; the villains (except for Lucas) are plausible and fairly honorable. The descriptions of Paris and Paris life in the late 16th Century ring at least somewhat true to me. I think it deserved its sales, and it seems to me it will still entertain contemporary readers who go in for this sort of thing. This book, aimed at children -- very young children -- was not really a bestseller. But I think the writer, and her several books for children, was pretty popular in her day. One of the joys of finding old books like this is the occasional quite unexpected things you learn about the authors. I bought this book at an antique store in St. Louis on a pure whim a little while ago. I'd not heard of the book nor the author. 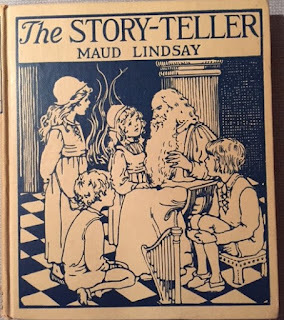 But when I looked up Maud Lindsay I found that she was really a pretty significant figure around the turn of the 20th Century. Maud McKnight Lindsay was born in Tuscumbia, Alabama, in 1874, the daughter of a former governor of the state. (Helen Keller was born in Tuscumbia six years later, and the entry on Lindsay in the Alabama Women's Hall of Fame says that she and Keller were childhood playmates and lifelong friends.) Lindsay became a kindergarten teacher, first at a private school, then, in 1898, she opened a free kindergarten in East Florence, Alabama, apparently a poorer area. She ran the kindergarten (which still exists, now named after her) until her death in 1941. Part of her teaching program was telling stories to her students, and so she published a book of stories, Mother Stories, in 1900. Twelve more books followed, a couple of them longer stories, but most collections of quite short pieces, suitable, I suppose, for reading to kindergarteners. 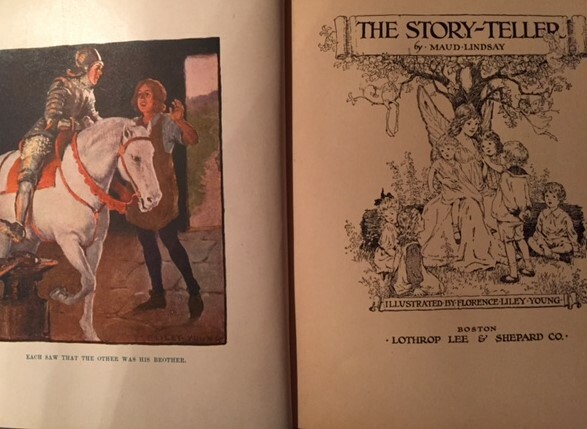 The Story-Teller was published in 1915 by Lothrop, Lee, and Shepard. My edition appears to possibly be a first (fine condition, no dj -- I don't think there ever was one). It is illustrated in color by Florence Liley Young. 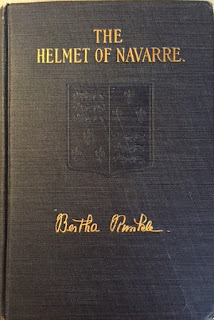 The front cover in some copies is colored, and mine is not, which may hint that it is not in fact the first edition, or that the color (including, apparently, gold leaf in the lettering) has worn off. Another interesting feature is a few songs, for which musical notation is given, written by Lindsay and set to music by Elsie A. Merriman (or in one case, set to a folk tune). These are all in fairy or folk tale mode, set in the standard cod-European settings of the most familiar (to Western readers of my generation, anyway) such tales. Most seem to be original to Lindsay, but she does credit other sources for a couple of stories: "The Promise" is based on an old poem ("told to me by Miss Harriette Mills"); "The King's Servant" is based on the Brothers Grimm tale "White Snake"; for "The Quest for the Nightingale" she credits Shakespeare, Joseph Rodman Drake, and a couple of old folk tales; and "The Lions in the Way" is based on an incident in John Bunyan's Pilgrim's Progress. As the lengths of the stories suggest, these are very simple pieces. For any but the very young, I think they are a bit too simple -- there is neither enough incident, nor enough conflict, to really hold the interest. But perhaps they are well pitched for very young children -- for kindergarten age children, and possibly the lengths are appropriate for classroom reading. The writing is clear enough. The stories tend to be very sentimental, and to make quite straightforward moral points. Only in a one or two is there any humor (mostly in "The Great White Bear", in which two foolish characters mistake a sheep for a bear). My favorites were "The Apple Dumpling" in which an old woman wants an apple dumpling but has no apples, and goes out looking for them with some plums, and ends up serially trading the plums for a variety of things before finally getting her apples; "The King's Servant", in which a faithful servant of the King goes to visit his mother and on the way helps out a bird and a fish and some ants, which redounds to his benefit when another evil King detains him; and "The Quest for the Nightingale", in which a fairy allows the Queen's nightingale to be stolen, and must go on a long quest to rescue it. Obviously at my age I am not the audience for these stories. I'm not sure many children will be any more, however. I think they are really too simple, and they lack sufficient wit, plot, or wonder to really make them memorable. Perhaps in their time they were serviceable, however, for their intended purpose. And, I will say, the book itself is a fairly attractive physical object. In the remaining categories (as, really, with all the categories except short fiction) I do want to emphasize what may be obvious – these are people and things that I personally enjoyed, but I know there’s a lot of excellent work I’ve missed. I’ll be nominating things that impressed me, but I’ll be glad to check out the stuff other people nominate. The first thing I’ll do here is mention myself. I am a fan writer (at least my blog writing and my stuff for Black Gate qualifies, if perhaps not my work for Locus, which I guess is now officially professional). I would note in particular my reviews of old magazines at Black Gate, particularly Amazing and Fantastic in the Cele Goldsmith Lalli era, and my various reviews of Ace Doubles here at Strange at Ecbatan (and often linked from Black Gate.) I would be greatly honored if anyone thought my work worthy of a Best Fan Writer nomination. But of course there are many wonderful fan writers out there. For years I have been nominating Abigail Nussbaum, especially for her blog Asking the Wrong Questions (http://wrongquestions.blogspot.com/ ), and I see no reason not to do so again this year. I will note in particular her review of Arrival, which captured beautifully the ways in which the movie falls short of the original story, but still acknowledges the movie’s strengths. One of my favorite fan writers does a lot of his stuff in a place relatively few people see, but he has begun to review Amazing Stories for Galactic Journey. This is John Boston, and his work can be found at this tag: http://galacticjourney.org/tag/john-boston/. The conceit at Galactic Journey is that magazines from 55 years ago are reviewed, with an attempt to make the reviews reflect only knowledge up to the point of publication of the magazine. (It will be obvious to anyone who reads my stuff at Black Gate that this sort of thing is right up my alley, and in particular that reviews of Amazing from the early ‘60s are of special interest, as I am (in a somewhat less disciplined fashion) trying to look at and write about as many issues of Amazing and Fantastic edited by Cele Goldsmith Lalli as I can.)) A couple of years ago John (along with Damien Broderick) published a series of books reviewing every issue of New Worlds and Science Fantasy from the Carnell era, which gives another look at his credential as a fan writer. Mentioning sites like Black Gate, Galactic Journey, and Rocket Stack Rank immediately brings to mind the Best Fanzine category. I plan to nominate each of these sites for a Best Fanzine Hugo. I’m particularly partial in this context to Black Gate, primarily of course because I have been a contributor since the print days (issue #2 and most of the subsequent issues). Black Gate was nominated in this category each of the past two years, but we declined the nomination due to the taint of (unwanted) presence on the Rabid Puppy slates. (I had suspected, and Greg Hullender’s analysis mentioned above suggests that I was right, that Black Gate would have been nominated even without the slates last year, but John made the principled decision to withdraw anyway.) Anyway, Black Gate is notable for publishing a lot of content on a very wide variety of topics, from promoting new book releases to publishing occasional original and reprinted fiction to Sherlock Holmes to reviewing old issues of Galaxy (Matthew Wuertz) and Amazing/Fantastic/etc. (me) to intriguing posts about travel and architecture by Sean MacLachlan. Finally, I’ll mention the other SF-oriented site I read and enjoy regularly – File 770 (http://file770.com/ ), which is (deservedly) very well known, having been nominated for the Best Fanzine Hugo numerous times and having won some as well, including just last year. I think they continue to be worthy of a Best Fanzine nomination. When I wrote about this category last year I especially recommended Sheila Williams (Asimov’s), Jonathan Strahan (the Infinity series and other anthologies (including a Best of the Year series), plus stories for Tor.com), and John Joseph Adams (Lightspeed, numerous anthologies, a Best of the Year series). I haven’t changed my mind – a look at my story recommendations shows how many good stories each of them published in 2016. Jonathan Strahan, besides the anthologies Bridging Infinity and Drowned Worlds, was the acquiring editor for one of the very best novellas of the year, The Dream Quest of Vellitt Boe. John Joseph Adams edited one original anthology, What the #@&% is That?, a horror-oriented book, plus Lightspeed, from which I chose three stories for my anthology; and Nightmare, a horror e-zine. And Sheila Williams, of course, continues to edit Asimov’s with remarkable distinction – every year that is the magazine with the most stories I consider for my book, including four that made my book this year, all of which will likely be on my Hugo nomination ballot. So once again I’ll nominate all three of those folks. The other two editors of Big Three magazines are certainly worthy as well – C. C. Finlay at F&SF and Trevor Quachri at Analog (which to my mind continues to improve). And Andy Cox’s work at Interzone and Black Static is impressive as well. And then of course there is Clarkesworld, edited by Neil Clarke and Sean Wallace. Neil is also editing a Best of the Year book, and he has been doing original anthologies as well (though none appeared in 2016). Sean is also co-editor of a very strong horror e-zine, The Dark. Clarkesworld in particular had a very strong year indeed in 2016. The other e-zine that really stood out in 2016 was Beneath Ceaseless Skies, edited by Scott H. Andrews, from which I chose 3 stories (and could have chosen K. J. Parker’s excellent “Told by An Idiot” as well.) I’ve said it before, and I’ll say it again – Beneath Ceaseless Skies is I think indisputably the best Fantasy-oriented ezine there is. To mention one more name – Ian Whates, at NewCon Press. He published two original anthologies this year, Crises and Conflicts and Now We Are Ten, from both of which I chose a story for my book. (Now We Are Ten, in particular, is a first-rate book from top to bottom.) And he is also the acquiring editor for one of the best novellas of the year, Alastair Reynolds’ The Iron Tactician. I haven’t even mentioned the two most decorated contemporary editors, Ellen Datlow and Gardner Dozois. And they of course remain exceptional editors. This year I didn’t see as much original short fiction from either of them (though both put out Best of the Year books), but Datlow was the acquiring editor for one of the best novellas of the year, Victor LaValle’s “The Ballad of Black Tom”, as well as other work for Tor.com. Gardner’s 2016 work was mostly reprints – his landmark Best of the Year series, as well as his role as reprint editor for Clarkesworld. In Best Editor, Long Form, I bow out. Between the fact that I just haven’t read enough 2016 novels, and that even if I have, I’m not always sure who was editorially responsible, I really can’t speak with any authority. I’m going to bow out of the rest of the Hugo categories as well. This doesn’t mean I don’t think highly of those categories – I do! But I just can’t say much intelligent about any of them. I have my favorite artists, but I forget, sometimes, what they’ve done lately. I don’t read graphic novels (and please don’t take that as a dis – it’s more a matter of “so many books, so little time”.) For Best Semiprozine, give me a list of the currently eligible Semiprozines, and I’ll have more to say – Beneath Ceaseless Skies is one, for sure, and definitely worthy of nomination; as is Uncanny, and Interzone. I am more or less clueless on podcasts. I don’t know what’s been good this year in related work – please enlighten me! UPDATE: A couple of Related Works did occur to me later as worthy of recommendation: Alvaro Zinos-Amaro's TRAVELER OF WORLDS: CONVERSATIONS WITH ROBERT SILVERBERG, and Chris Offutt's MY FATHER, THE PORNOGRAPHER (about SF writer Andrew J. Offutt). Finally, the John W. Campbell Award for Best New Writer. This is given to the best writer whose first professional publication in the SF or Fantasy field appeared in the past two years (2015 or 2016). Writertopia has a page, not guaranteed to be complete, with a list of eligible authors: http://www.writertopia.com/awards/campbell . From that last, a couple of names stand out for me. One is Charlotte Ashley, whose story “A Fine Balance” is in my upcoming Best of the Year book, and her first pro sale, “La Heron”, was pretty close to being in last year’s book. The other is Ada Palmer, for her impressive first novel,Too Like the Lightning, which I have already discussed. Other new writers who have particularly impressed me include Nin Harris, Malka Older, T. R. Napper, Steve Pantazis, Sunil Patel, Laurie Penny, Eric Reynolds, Tamara Vardomskaya, and Benjamin C. Kinney. These novels both come very early in their authors' careers. 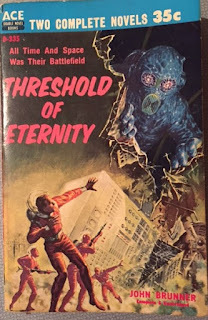 Depending on how you define "novel", Threshold of Eternity is Brunner's first, second, or third. 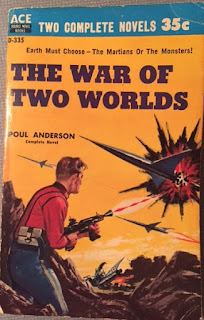 And The War of Two Worlds, if you want to call it a novel (at some 35,000 words, it is shorter than the offical SFWA definition), might be Anderson's second. I've written about both authors before, so I won't recap biographical details. Both were very prolific writers. Anderson became an SFWA Grand Master, and I think Brunner would have been one too, if he hadn't died so young (aged only 60, at the 1995 Worldcon in Glasgow). Both were proficient in entertaining adventure-oriented SF, but also, especially later in their careers, produced serious and challenging work. So to begin with the longer novel -- Threshold of Eternity. It opens in California in 1957 or so, as one-legged Red Hawkins encounters a French-speaking girl who couldn't possibly be there -- and, indeed, it turns out that Chantal Vareze was just in London. What's stranger is the other person they soon encounter, a man named Burma who turns out to be from thousands of years in the future. We jump, then, to the future, where Magwareet is helping to coordinate humanity's desperate war against mysterious aliens called The Enemy. One of the side effects of their battles, and also of a strange entity called The Being, is temporal surges, which can throw people into the far past. And Magwareet has just realized that his friend Burma has been flung into the past, to the distress of Burma's wife, Artesha, who we soon realize is embodied in the computers that control human society. Meanwhile a sort of "city in flight" (a la James Blish) has been encountered, infested with one of the Enemy, who becomes the first humans can capture alive. Soon Burma has shanghaied Red and Chantal to his future. Red in particular is annoyed, but he is soon placated when their magic tech fixes his leg, and also when he learns the super-efficient language the people of the future speak, which helps them think more clearly, so that Red realizes all his hostility was due to resentment of his handicap. The two are quickly recruited into the war against the Enemy, which ends up involving more trips to the past (Holland in the 16th Century), as well as doppelgangers for most of the main characters, and eventually a realization of the true nature of The Being, and a curious (and, to me, unsatisfying) ending, with a really strange fate for Chantal in particular. It's all kind of a mess, but amid all that there's no denying Brunner's imagination -- even if it comes off as downright 1930s superscientific guff much of the time. It's interesting to note that Damien Broderick, one of the underappreciated SF writers of our time, and a writer with a history of fascination with wild SF ideas, has written an "elaboration" of Threshold of Eternity, due out from Arc Manor later this year. Poul Anderson's The War of Two Worlds was first published, as I note above, as "Silent Victory" in the Winter 1953 issue of Two Complete Science-Adventure Books. This was a magazine that published two short novels per issue, often reprints (sometimes abridged) but also often originals. 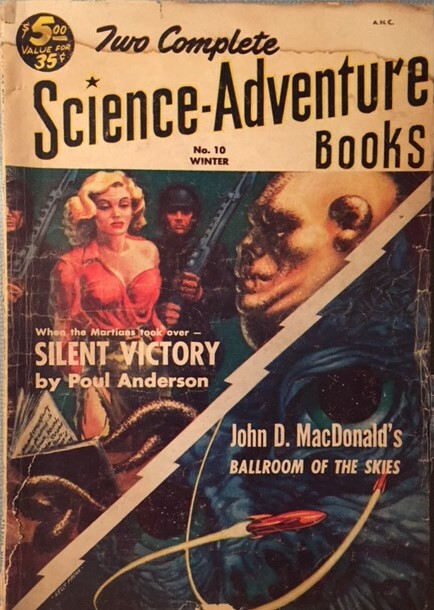 The other story in this issue was an abridgement of John D. MacDonald's 1952 novel Ballroom of the Skies. It opens with Intelligence Prime, now the alien ruler of the Solar System, receiving a manuscript written by David Arnfeld, who had discovered the aliens and tried to start a resistance, before being betrayed by his companion Christine Hawkins, in order to save her young child. The rest of the book is Arnfeld's manuscript, which opens as he, once part of Earth's Space Navy, returns to a defeated Earth after a bitter and useless war with Mars, that Earth lost. Arnfeld makes his way to upstate New York and his old farm, along the way acquiring Christine Hawkins and her young daughter. Once at his farm he is disgusted to learn that he will be forced to accomodate a Martian garrison, commanded by Sevni Regelin dzu Corothan. Inevitably, if slowly, he comes to realize that Regelin is as honorable a creature as he hopes he is himself, and they reluctantly become sort of friends, despite Kit Hawkins' hostility. (It will not surprise the reader that Kit and David are falling for each other.) David soon realizes that Regelin is just as disgusted and confused by the war between Earth and Mars, and by its incompetent conduct, as he is. And then they have visitors -- a senior Martian and his human Quisling. And by accident, David electrocutes one of them, and it shapeshifts -- it is an alien! We can see right away what has happened -- the Solar System has been invaded by shapeshifting aliens, who took the form of leaders of both Earth and Mars, in order to force them into a foolish and destructive war, after which they can take over both planets. David, Kit, and "Reggie" begin a desperate attempt to raise awareness that the Martian leaders and their human collaborators are infested with shapeshifters ... but how can they succeed, when any of those they encounter might be aliens themselves? The resolution, frankly, is unconvincing. Along the way, though, Anderson paints of picture of not two but three desperate races, forced into terrible acts for understandable if regrettable reasons. It's reasonably fun, if very very minor Anderson. The two first novels I mentioned are All the Birds in the Sky, by Charlie Jane Anders; and Too Like the Lightning, by Ada Palmer. Both are fairly seamless mixtures of SF and Fantasy (though Palmer’s novel reads like pure SF with a difficult to explain fantastical intrusion, while Anders’ novel reads like Fantasy set in a pretty SFnal near future.) All the Birds in the Sky is the story of Patricia, who can talk to birds, and Lawrence, who has invented a two-second time machine, as they grow up, both somewhat dysfunctionally, and end up friends and sometime lovers in a near future facing imminent collapse due to global warming. Both promote solutions – Patricia’s fantastical, Lawrence’s science-fictional, and both make terrible mistakes, before a literally earth-shaking conclusion. It’s funny – Anders is always funny – and serious as well (Anders is usually serious too). I really liked it. Too Like the Lightning is set several centuries in the future, in a world divided into “Hives”, cooperative family-like organizations with different strengths. The narrator is Mycroft Canner, who, we slowly learn, is a criminal (and the nature of his crime, only late revealed, is pretty appalling), but who is also quite engaging, and an important mentor to an amazing child who can bring inanimate things to life. This novel introduces a conflict – a threat to the world’s balance of power – and also intricately sketches the complex background of this future, and introduces a ton of neat characters. Then it stops, which is its main weakness – it is but half a novel. The sequel (Seven Surrenders) is due in March 2017. In the end I was impressed but unsatisfied – leaving a novel perhaps not quite Hugo-worthy (though the author is surely Campbell-worthy! ), but a novel which will compel me to read its sequel, which, if it sticks the dismount, might be Hugo-worthy itself. Speaking of first novels, one that I haven't read but definitely need to get to is Ninefox Gambit, by Yoon Ha Lee. Lee has been doing really outstanding work for a long time -- I've used a few of his stories in my anthologies, and in a way it's a surprise that his first novel is only coming out now. But it looks very interesting indeed. And immediately I see a problem – common to series, I think. While I’ve read and enjoyed many books in each of these series, I’ve fallen behind in many of them. I didn’t even know there were new entries in Ellen Kushner’s Riverside series or David Drake’s RCN books. (And, hey, speaking of problems with the Best Series Hugo, does Delia Sherman get a Hugo too if the Riverside series wins, as she co-wrote one of the major novels in that series, The Fall of the Kings?) Which, by the way, isn’t a bad thing from my point of view – I’ll be glad to grab the new books in both of those series. There’s also a big difference in the types of these series. Some comprise several books with a fairly coherent story arc: certainly Jo Walton’s Thessaly books are a pretty tight trilogy; and the Temeraire and Expanse series, a bit more loosely, are still pretty coherent. Some represent mostly just a universe in which to set stories, with perhaps some sub-arcs: the Liaden books, the RCN books, the Vorkosigan books, for example. Dread Empire’s Fall is an original closely unified trilogy, followed by two much shorter pendants (one about each of the two main characters of the original trilogy). I suppose this isn't really a fatal problem – the voters can judge for themselves how to evaluate each of these types of series. This potential new award, as I mentioned, would not be a Hugo, but would be administered and awarded by the World Science Fiction Society. For this year, I have little to say – I really haven’t read enough books in this category to make any ruling or recommendations. I can recommend a look at the Locus Recommendation list, which includes a section on YA novels: http://www.locusmag.com/News/2017/01/2016-locus-recommended-reading-list/. I will say that I’m intrigued by the presence of Alastair Reynolds’ Revenger, which I didn’t know was YA. And I’m sure that many of these books are very good work indeed – but I haven’t read them, so further deponent sayeth not. To my mind, this is one of those years in which the Hugo for Best Dramatic Presentation, Long Form, should be awarded by acclamation, to Arrival, an excellent film based on one of the very best SF stories of all time, Ted Chiang’s “Story of Your Life”. Of course, being based on a good story doesn’t guarantee a good film (as those who have seen the movie version of Nightfall can testify, or so I am given to understand) – but Arrival is a very good film (if not, to my mind, quite as good as the original story, which is hardly a complaint, as the original story is so great). Beyond that, I will say that I enjoyed Rogue One, but didn’t love it – it will probably get a nomination, and deservedly enough I suppose, but it would be a disgrace if it won. I have seen suggestions that Hidden Figures could be nominated – that seems silly to me, but I suppose it would get the Apollo 13 exception. (If so, can I nominate Michael Chabon’s Moonglow for Best Novel?) I don’t really have any other obvious candidates. As for Short Form, I don’t watch Doctor Who so I’m not allowed to nominate. (Joke!) Actually, I don’t watch that much TV – I just started on The Magicians, which I am enjoying so far, and I suspect I would like The Expanse, and I know there’s lots of other cool stuff out there. But I haven’t seen enough to judge.